Chicken Soup for the Soul has just announced their exciting new relationship with TV Land and the cast of their brand new comedy, Jennifer Falls. As part of this unique partnership, Jamie Pressley’s character, Jennifer Doyle seeks the help of Chicken Soup for the Soul’s publisher, editor-in-chief, and author, Amy Newmark. Join the fun as Jennifer shares the hilarious stories of her journey, and have a chance to win exclusive prizes via Chicken Soup for the Soul’s website, newsletter and social media channels. After Jennifer Doyle lost her high-paying executive job, she also lost her condo, her beach house, and all her other possessions and was forced to move back into her mother’s house with her disgruntled teenage daughter. Now she has to endure the indignity of working as a bartender for her brother. Jennifer seeks help from an old friend and colleague who went to Harvard. The friend suggests that she speak to one of her Harvard classmates, Amy Newmark, at Chicken Soup for the Soul. Amy, having held a variety of high-powered positions in business, and having published thousands of stories from people going through tough times becomes a mentor to Jennifer as she reboots her life. Tune in to watch Jennifer Falls on TV Land every Wednesday at 10:30/9:30c starting June 4th on TV land! Plus enter my giveaway below for an exclusive Jennifer Falls Citrus Zinger water bottle and Chicken Soup for the Soul: From Lemons to Lemonade. Plus, click HERE to get the Chicken Soup for the Soul, Get Happy app! Ready to enter to win? 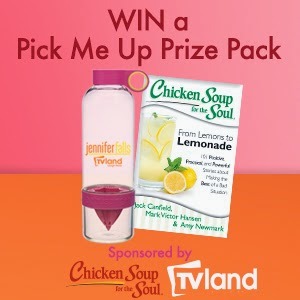 Enter to win the Jennifer Falls Citrus Zinger water bottle and Chicken Soup for the Soul: From Lemons to Lemonade! Just fill out the Rafflecopter form below for a chance to be the lucky winner. Open to US residents ages 18 and older. Only the first entry is mandatory; bonus entries increase your chance to win. Giveaway ends at midnight on 6/16/2014. Good luck and don't forget to catch the season premier of Jennifer Falls Wednesday 10:30/9:30C, starting June 4th on TV land.